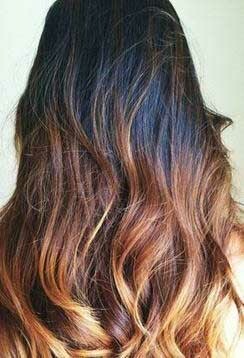 Ombre is a French word meaning “shaded.” Ombre highlights have become an increasing fashion trend. With regard to your hair, it is the process of a slow melting effect of a darker shade that gradually gets lighter toward the end of your hair. When going in to get an Ombre, you need to have realistic expectations on what this will entail so you can make an informed decision. Sometimes this (like other coloring services) cannot be achieved in one visit but is a goal to work towards in your next few visits. This all depends on the color you currently have, what your color goal is, and how your hair takes to color (your genetic makeup). The current health of your hair plays a huge part in your color outcome, which is why it is so important to use a professional home maintenance program. Make sure to purchase this from your salon to guarantee you are getting what you are paying for. Additionally, getting regular trims (every 4-8 weeks), as well as putting the health of your hair before the desire of a color change, are important factors that relate to your color outcome. The Ombre process does not require a lot of regular color maintenance. The darker shades near your scalp are usually close to your natural hair shade. It will help buffer and grow-out lines will be less obvious. As with any coloring process, it is a must that you take care of your hair. When you do, everyone will notice! Your hair will be soft and modern looking, with gradations of color whether you put your hair up or curl it. Be sure that your hairstylist works with your color schemes. The best way to achieve the look you want is to take in a photo to your hairstylist. Be specific and tell them exactly what you like about the photo and see if your stylist can duplicate what you like about it. For example, if the photo shows some brown and blonde at the bottom of the hair and you like that, point that out to your stylist, so your ends are not all blonde. If you like your natural color on top, then you can keep your costs down and not have as many colors added to your hair. Each new color is an additional charge. As with all coloring, Ombre coloring can cause hair damage. In order to achieve the ultra light blonde on the ends of your hair, most of the hair will have to be bleached. This can cause major damage to the hair. The damage is permanent until you cut it off. Regular trim appointments along with your salon shampoo, conditioner, and treatments will keep your hair healthy and shiny. Once your hair is highlighted, it can be difficult to add pigment to the light compromised ends. If you choose to do this type of highlighting, commit to this look for at least 3-6 months with regular regrowth touch ups and trims to maintain the least amount of breakage to your hair. To maintain your hair, ask your stylist for a great weekly deep conditioner to use and products that will help style and protect your hair from heat and external damage.